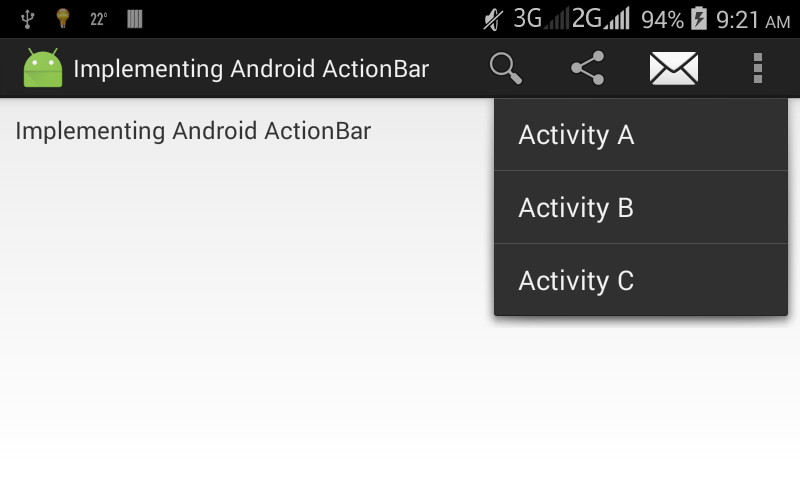 This post shows you how to implement basic android action bar (ActionBar) to your android application. Action bar allows you to display the title of the activity, app icon on the left and also displaying option menu. You can customize android Action Bar in your own way. You can change action bar app icon, app name, text and background color, add menu items with icon, Action Bar tab and lots more. Here I will show you how to setup basic android action bar with app icon, app title and also show you how to add menu item in Action Bar. Let’s start step by step to implement android action bar. After completing these steps, now run your Implementing Android ActionBar application then your application will look like following screenshot.